Prompt action taken when your customer signals financial problems is one of the most effective ways to minimise risk when your customer goes bankrupt. 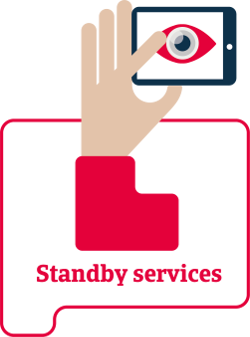 To that end, our Standby Service is designed to monitor the status of your customers and the market, and is ready for action when any triggers are set off. Our Standby Service can be applied to any stage of the entire order-to-cash cycle, from invoice to litigation. Aimed at financial institutions, this service provides additional security in the event a customer runs into problems. It is available in a single module or as complete cover. We initiate local or international collection activities with agreed timescales (any configuration can usually be activated within 48 hours). Our Standby Service provides additional security and enables financial institutions and factoring companies to offer Asset-Backed Securitisation programmes on the basis of our strong ratings.